There's our snow from yesterday. It sure is pretty, but you can see it sure was plentiful too. The kids in our city were off of school, so that meant it was a play day for us. :) I have noticed, however, that the longer winter stretches on, the less participants I have volunteering for outside play. Seriously, when did my child get so big??? Last year he couldn't even carry this sled. 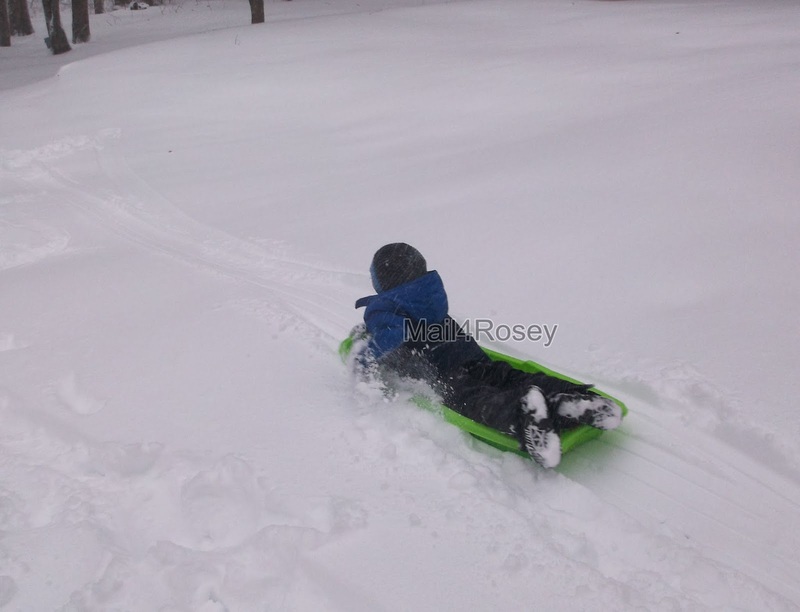 My youngest son though, is always up for it, especially if there's snow. 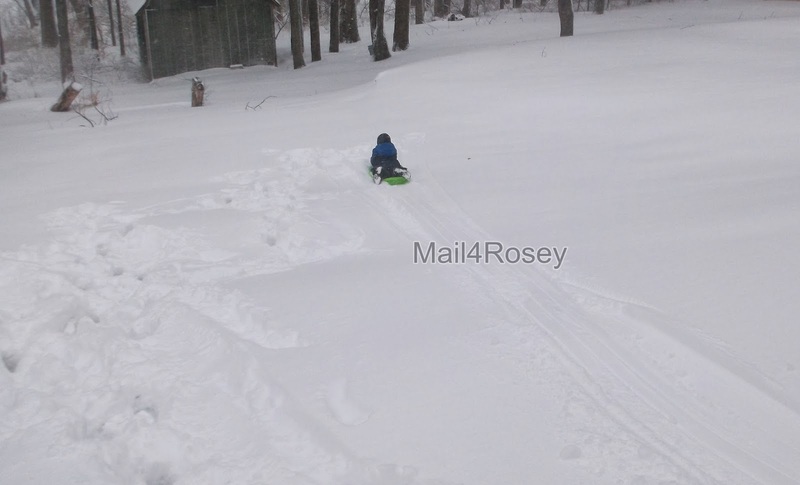 I'm not sure if sliding down the hill, or running up it is more fun for little man: He laughs equally hard at both. He's getting pretty good at it too, and doesn't even mind the wipe outs. Going down the hill on his stomach. Yesterday, he even opted for trying some tricks on his own (first time ever). Oops, not so much steering control for him on the saucer. 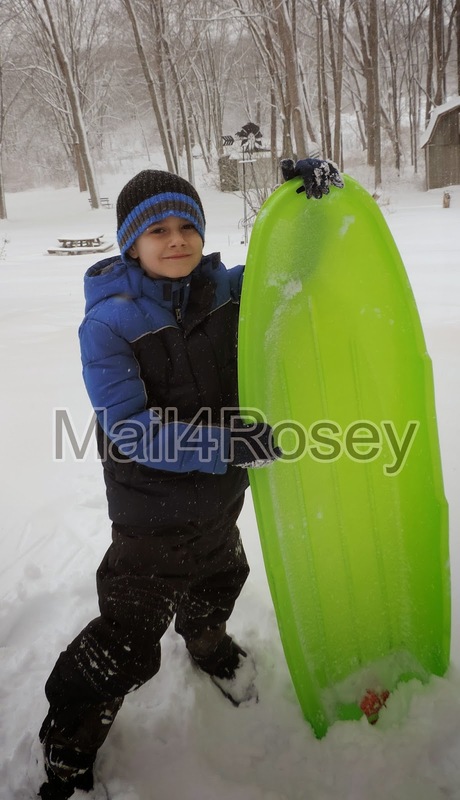 Hi Rosey - so pleased you're encouraging all to go outside and play - your youngest certainly looks like he's having loads of fun - and that is some deep snow. Fog is hard to drive in. I do love that you have sunshine!! We've seen it a couple of days in the last couple of weeks and it really does cheer you right up. That looks so fun I want to go sledding. 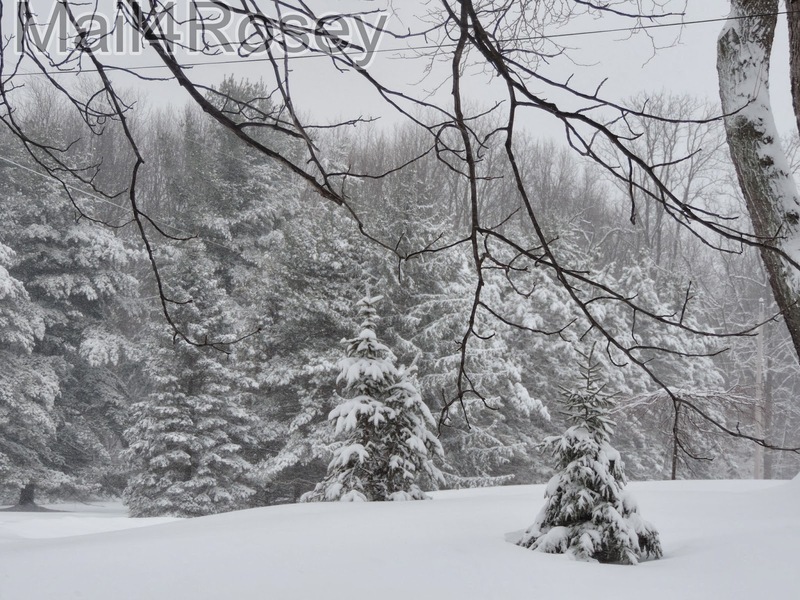 We still have tons of snow here to Rosey ! I am sure your Son would love one of our Aussie to run alongside that toboggan with him :) ... should be doing a blog post for them later today I hope. My kids will go out and play in snow no matter what too. I am thanking god though that we didn't get the snow that was predicted for today. It got cold again, but no snow. It was negative five this morning when I went out. It felt it too. Looks like such a grand ole time!! I wanna go sledding and make snow angels and build snowmen and have hot cocoa afterwards! That looks like a lot of snow! Glad he was able to enjoy it. That looks like fun! I love the snow when you can get outside and enjoy it. My kids have a blast, the deeper the better in their eyes, lol. Your little guy looks SO joyful! I remember my favourite ski run as a kid...down a hill, over a little 'crick' and a fence....such fun and I felt like I was flying! Is it bad that I giggled when my brothers would try the run and invariably land in the creek or face-first in the fence? Looks like he had a blast! 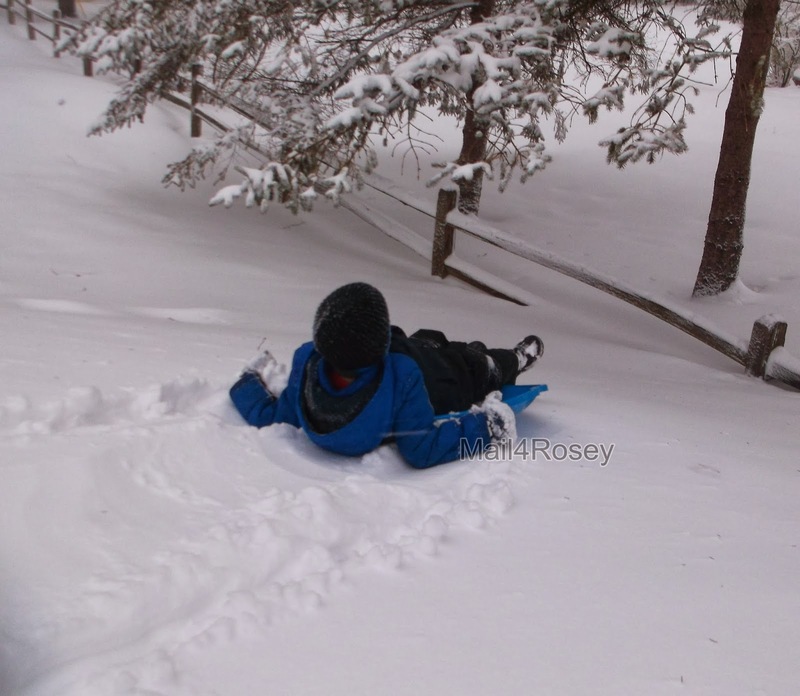 My daughter is hoping we get another snow before the winter is over so she can go sledding again. I'm kind of hoping we don't though! I live in So Cal where it doesn't snow unless you live in the mountains. It sure does look pretty though. How fun to have a play day. Nice to see you kid playing in snow! The snow is pretty but I wish it would only last about a week :) So glad to see your son enjoying himself, brings back many good childhood memories. Back in the day when everyone was outside playing. It snowed here yesterday too but not nearly that much! It was rainy and yucky and today it's COLD!! He looks like he's having so much fun! It's cold here now too. Really cold! I love the bravery of kids. I would love a snow day like that.. we get ice! BUT then again.. I only like 2-3 days of snow... not what some states get. I like small doses. I want some of that snow! The prolonged drought we're facing is driving me crazy. Love the pics, Rosey! I hope you get some well needed rain soon! Rosey, you have a positive attitude and that's wonderful! Guess I should make the best of it too! :) But it ain't easy trudging out to that chicken coop in the snow and cold! Ugg! My beef is the early morning school drive when the roads are still icy. Makes me nervous. It sure is beautiful, but wow that's a lotta snow!!! I wonder if this is the last cold snap. It was 70 here yesterday - today 30ish degrees colder. You have such a great attitude about this. I have forbidden anymore snow. Luckily we already had our little March skiff and hopefully that's all we get until December. It does look like a lot of fun! I wish we still had fluff here. The boys love it. Unfortunately now we have ice and rain mixed in so no more playing. Just tons of cursing while we try to drive! Driving in it is the worst! The snow is beautiful, but I think it was even more beautiful in December and January. We're on Spring Break this week, and I think I'm over wanting the snow we never really got. Where are you? I see, Michigan. You must be close to my daughter who is in Ann Arbor. She too wants to go into higher education and currently holds a fellowship/job at the University of Michigan. That's an amazing school to hold a fellowship/job with...I see them cited more in research than I do most any other school. You mentioned this hill the other day. You're right it's great for sledding. It's spring around here and next Sunday and Mondays it's expected to be in the 80s. What a difference in temperatures and weather. I've never gone sledding, but it looks fun! Enjoy the cool weather while you can. It will be HOT before you know it! We usually do have a stretch of hot in the summer. Last year though, was such a mild summer. There were not many hot days at all. It was nice. The downside though, is our winter was just brutal this year. I agree, if there is still snow why not go outside and enjoy it! It looks like your little boy had a lot of fun playing in the snow. Sorry - I'm past enjoying it lol - way past it - but loved seeing the photos of your son having fun. It made me wonder at what age exactly do we start hating it after a month or so? Children are such a lesson to us in so many ways - least of all living for the moment! You're SO right; Enjoy it while you can, make the most of it. Looks like a BLAST!! You have to admire kids and the way the make the best of any weather condition. I use to enjoy winter in the north by looking out the window and not being in it. I love the snow for the first month of winter and then I'm over it. I know the kids never get tired of it though! Looks like they had a blast! Last summer was the first really mild summer I've ever been a part of and we've lived here almost 7 years now. I was surprised. This is also the worst winter I've been a part of... wonder if they're related. I totally slacked this winter and didn't do much of anything! Thanks for the inspiration! We still have a little snow, I need to get out and enjoy it before its gone! I still have a snowman to build on our list of winter things to do. It's gotten cold again now though, so we have to wait a bit for it to warm back up. Oh my gosh, you and I would have made quite the pair watching. I was roaring with laughter over it!!! That's quite the fluctuation in temperatures!! I'm glad you made the best of it. I'm SO over this winter. Two weeks until Spring! Spring Break this year is going to entail snow in a lot of places, lol. We just got a snow like this too - and it was just as pretty on the trees... but yeah. I'm over the snow haha. Looks like your son had a good time though! Snow does look so pretty on the trees. Beautiful scenery. Love it - and play time is toooo short. Get in while you can! I agree, play time is way too short. I'd rather have snow than the arctic wind we've got going today. My kids love sledding. I wish I could like this post- ha ha! I am sick and tired of snow! We live in Michigan and we've had a snow storm every single week since December. Your kids are super cute tho! We're in Michigan too. Going on my 7th year, and this is the worst winter I've seen since moving here. I agree, if it's out there take advantage of it. Looks like a fun day, thank you for sharing. My son would love that too! Looks like a lot of fun! I think you have the right idea: embrace and enjoy it. Spring will come!!! Oh, it's so pretty but I'm definitely ready for it to be gone! Spring, where are you? It's warming up today. I might even get to go break up some of the ice out on the exterior of the house, woot! We were in the 70's yesterday and then calling for snow again tomorrow! Crazy!! It's all so pretty! I must have told you often, but I really, really miss snowy winter days. Playing outside in the cold? What are you doing to your child? The snow looks so much prettier in your pictures than it does in our yard. I am so tired of snow! I wish I had your son's enthusiasm for the snow!! The snow's almost completely melted over here. Yay, some semblance of Spring. At this point even my kids are tired of the snow. We're finally starting to see our lawn again - but I hear more snow is on the way for St. Patrick's Day. Ugh! Sigh. We're so tired of snow too. We got rain not snow this week but with that and the wind and temps dropping to 7, we have ice yards right now. It is coming. :) We've had an ice yard this year too. UGh I'm so over winter. LOL It's almost spring. The birds were out singing away this morning. You got quite a bit more snow than we did. It is suppose to go up into the 50s today and then snow again Monday. UGH!! I can't wait for camping season. Awe what fun! We havent got to go sledding at all this year. So pretty! We haven't had any snow here in Seattle this year - miss it!! I am trying very hard not to be jealous. :) We usually get snow every year, and we only had one real snowfall. :( Enjoy every moment! Your pictures look amazing. Is the snow starting to melt now? 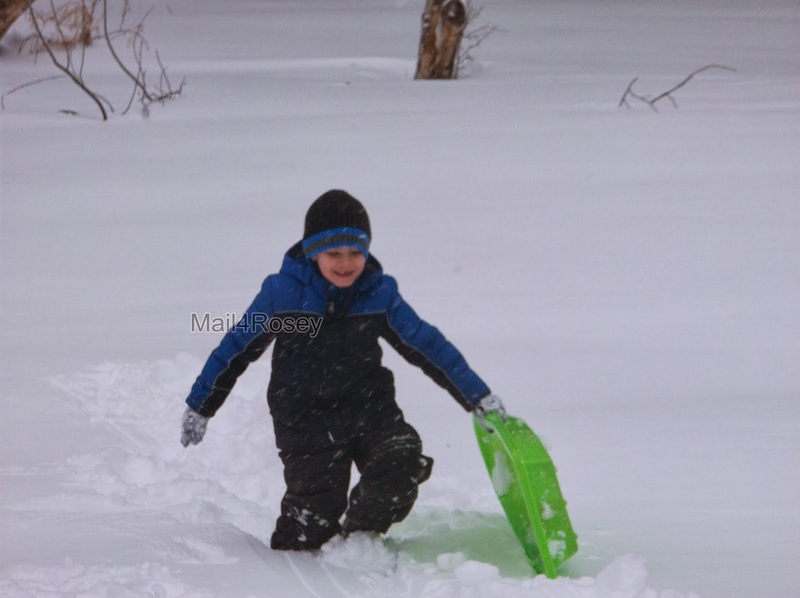 You boy is so cute having fun out in the snow! Gosh that is a lot of snow at your house. Our snow has melted now. I am glad, and it has warmed up. Spring is coming, I hope you are glad to get out of winter!! My son is like your son. He begs for snow. He would LOVE all of that fun right there. And yes your little man is really growing up! Isn't he getting big, Colette?!?! I bet you're going through the same too. It's fun watching them grow, but it's going way too fast!!!!!!!!!! Aww, he looks like he is enjoying himself! 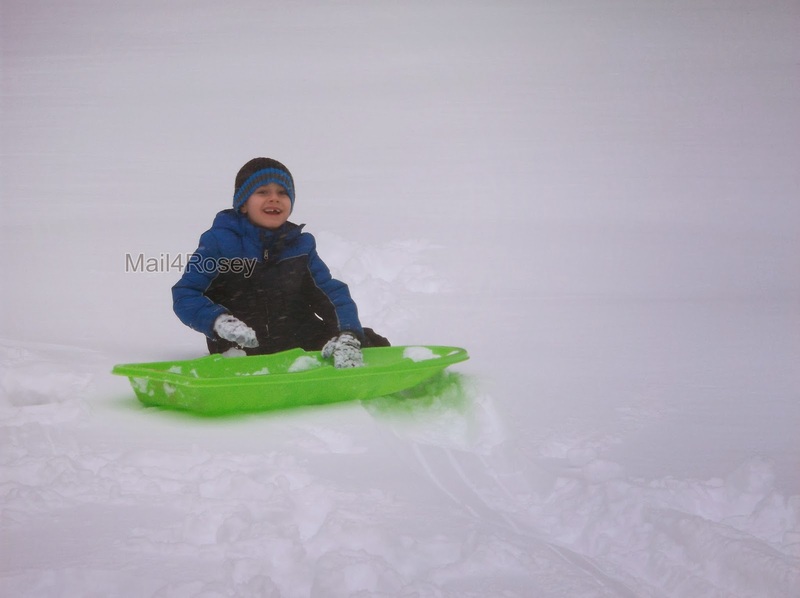 My son would love sledding too. (Might as Well Enjoy it While it's Here) Oh, my goodness, I am glad you are enjoying the snowy weather. Here in northern Illinois we had almost a total of 70 inches of snow this past winter. We are so ready for Spring to come and visit us finally! My kids were so excited for all of the snow, in the beginning. Now even they are sick of it.